Dartmouth graduate Richard Hall and his brother Louis were early volunteers to the American Field Service. On Christmas Day, the highly popular Richard was making some deliveries in his ambulance in the Vosges Sector. A seemingly random German shell hit his ambulance and killed him. Hall was given a hero's burial at the miliatry cemetery at the hospital center of Moosch, a small Alsatian town about 30 km west of Mulhouse. 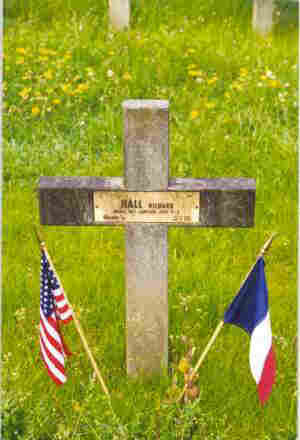 The photo of Richard Hall's cross was taken shortly after Memorial Day 1999 by Eric Mansuy. The two flags of France and the United States were apparently placed to recognize the American Holiday. The inscription mentions his unit, Sanitary Section #3.